For the last few years I’ve been busy working on a book about governments that deliberately starve their own citizens, which is why I’ve been posting the occasional entry on North Korea on this blog. As part of this project, I’ve been learning about faminogenesis—or state-induced famines—of the past. In the twentieth century these included the Communist famines—3.3. million people starved to death in the Ukraine in 1932-3, somewhere between 30 and 45 million starved to death in China during its so-called “Great Leap Forward” from 1958 to 1961. 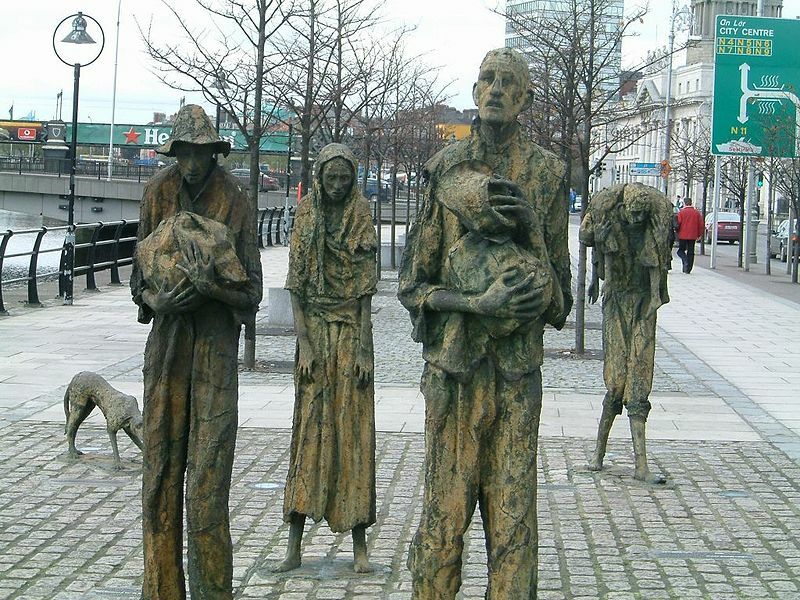 The most well-known political famine of the 19th century was the Irish “potato famine” from 1845 to 1851, during which it’s estimated one million of Irelands’ 8.2 million people starved while another two million emigrated, many hundreds of thousands to England and the rest to Canada and the United States. 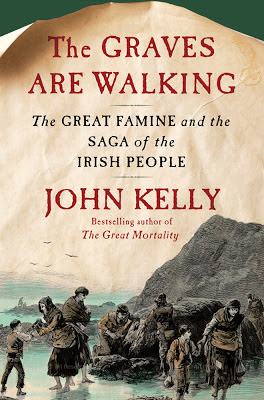 John Kelly published a brilliant and horrific account of this famine in 2012 with Henry Holt, entitled The Graves are Walking: The Great Famine and the Saga of the Irish People. Kelly uses memoirs and diaries of observers and relief officials who describe the horrible conditions in which the Irish lived and died. Some of these observers and officials were so upset at their inability to do anything to help the starving that they killed themselves. The descriptions of the Irish in Kelly’s book resemble descriptions of Jews in concentration camps during WWII, or of prisoners in the North Korean gulag right now. The Irish famine wasn’t really state-induced, though, the way the Ukrainian and Chinese famines were. No one planned it or instituted policies that would make it happen. Instead, potato blight arrived, ruining the 1845 and 1846 crops. Irish peasants subsisted on potatoes and when that crop failed they had no cash to buy other products. It is true that even as they starved, other kinds of food were sailing down the Shannon River from Ireland to England; this is why many people think that the Irish famine should be considered a kind of genocide. On the other hand though, the British eventually did try to buy food for Ireland from America, but there was a worldwide shortage at the time and other famine-stricken European countries such as Belgium and Germany were also trying to buy food. There was also a shortage of commercial shipping, though the British did consider-and rejected-the idea of using the Royal Navy to take food to Ireland. So maybe this was famine by neglect. Another way to look at it was as famine by ideology. There was a small group of influential men in the British cabinet and bureaucracy who adhered to a philosophy called “Moralism,” which meant that people should work hard and take responsibility for themselves. The Moralists thought that the famine would teach the “lazy’ and “indolent” Irish a lesson. They thought that it was too easy to cultivate potatoes, so the Irish had never learned to work hard. An ideology of market fundamentalism also helped starve the peasants. The Economist, a journal that I read assiduously nowadays, said “It is no man’s business to provide for another,” while the Prime Minster, Lord John Russell, worried that if the British were to distribute free food, it would upset the markets and purveyors of food would not be able to make a profit. He thought the peasants should work for their food, so for the first couple of years of the famine he established “public works” projects (breaking rocks to build useless roads) to provide employment. “Lazy’ Irish men, starving and naked (they’d sold their clothes to buy food) marched miles every day to earn a pittance of a daily wage to buy food for themselves and their families, many dying en route. Self-interest also played a big part in the British government policy. Several members of the Cabinet were landowners in Ireland. They thought the famine would be a great way to clear out peasants from their properties so that they could convert their land to large-scale commercial farming. So they took the opportunity to engage in mass evictions of all the peasants who couldn’t pay their rent. They also wanted to get rid of the peasants because as landlords, they had to pay a “poor rate” (or tax) that steadily increased as the famine progressed, and they were also responsible to pay the rates on behalf of peasants. The fewer the peasants on their land, the less the tax they had to pay. Even after they left Ireland, the peasants continued to die of starvation and disease. Death rates on ships to Canada were 15 to 18 per cent. Tickets to Canada were cheaper than tickets to the US (£3 as opposed to £5) because the British government only required boats to Canada to provide 10 square feet of space per person, whereas the Americans required 14 square feet. The Colonial Secretary didn’t want to raise the standard on the British boats because then the fare would d be more expensive and fewer Irish would go to settle in Canada. What are the lessons here? Some people think that when food aid goes to the starving nowadays, it should be sold so as not to upset local markets. But what happens when the starving don’t have any money to buy the food? How do we make sure they get work, and how do we make sure they don’t lose all their property? If they eat all their seed, as the Irish did, what do they have to plant after the official famine ends? And do we have an obligation to admit the starving millions into our protected and prosperous countries?